Today was a wet sometimes, but mostly grey, cold day. Till about 7:15 this evening. This is looking east across the plaza towards JAM and Northlight Art Studio. Hope it's a sign for a better day tomorrow weather-wise. The Vane is back...and its all new! Today was a real celebration for members of the Sharon Congregational Church and history buffs as well as the new fish vane was positioned 108' up on top of the steeple. It was constructed as a copy of the original by Will Trowbridge of Sharon. Many man-hours went into crafting this, and Mrs. Bhumgara of Sharon applied gold leaf to add to its beauty. A crane from Torrington, capable of reaching 165' vertical provided the needed lift bright and early this morning. This sight drew lots of on-lookers and succeeded in slowing workers going to work. The weather was co-operative and we had no rain, yet within a hour after finishing, it was pouring. The fish was installed by Will and his assistant John Haas from Amenia. Because of its location (108' up), Will took tools and parts up with him, and did some final work while installing in place. Mounting pins had to be shaped and ground with portable tools and holes had to be drilled-out. This fish may not be touched by human hands again for 100 years or more, so the men took about 90 minutes to complete the installation. With the newly mounted lights lighting the exterior of the steeple, the church certainly has taken on a new image on Main Street. Congratulations go out to the members of the church for maintaining the beauty and the history of this fine piece of history at 25 Main Street in Sharon. I guess the lesson from this bobber in a tree is........take more than one when one goes fishing? Wonder what can't be seen that normally can? How about a big, local valley, with a lake in the middle, hills in the distance and two kind-of famous oak trees. Ring any bells where I am? Members of Loucks Electric of Sharon were hard at work Tuesday morning installing more small spots to light the front of the church as well as lights to light the steeple. The lift wouldn't reach high enough to get the in-between, so another lift will be brought in to finish the work. Workers here were Bob Luminati on the lift and Jesse Loucks way up on the steeple. Our own Sharon Volunteer Ambulance has been raising funds (as they always do) for a major purchase. A new ambulance is in need!! This new "dollar thermometer" appeared in the last day or two on Union Savings Bank side lawn. I wish one of our more "financially capable" neighbors could write them a big check to finish up this drive, allowing the volunteers to concentrate on what they do best....helping folks in their time of need and not out raising funds. When I was a kid growing up here, we used to go over to Winchell Mountain, up on sunset ridge, and watch the sunset over the Catskills. Well, thats all grown in now, but I am very fortunate to have my own little sunset ridge just up from my house. Incredible! Took a ride down South Main yesterday morning and boy, do they do flowers down in that direction!!!!! Here you see the entrance to my home here in Sharon. NOT! I have a few favorite "spots" in Sharon and on a bright sunny morning, this is one of them. Really an exceptionally piece of property and the use of it. Just gorgeous. The 114th Boston Marathon is this coming Monday, the 19th. I was reading in todays Waterbury Republican where six local area folks are putting themselves to the grueling test. Two folks with ties to Sharon are included. Matte Mette, our Town Rec leader is in there as well as Liz Foster of Sharon. 26.2 miles, Hopkinton to Copley Square. 26,000 runners. I am sure we all wish them great success. Not a very exciting post today. Saw a brand new large phone line get run to the side of Union Savings. The trucks came stringing it down Gay Street right to the building. Either the bank or Bob's office upstairs is getting set up big-time with a line like that! N.Y. Giant Fans finally Rejoice!!!! I spoke to Jason from Monroe Tree last Friday morning who said they were about two weeks ahead in their tree feedings as compared to last year. I looked back at my blog and found when I took pictures of the trees in the plaza last year. I guess we are ahead! I know this may have come as a shock to some, but Clare & I actually got out of town for 48hours. Whoa! Yeppers, we took some life-long friends up to Maine and gave them a nickel tour of our stomping grounds. Kittery, Yorke, Yorke Beach, Freeport, Brunswick, Bailey and Orrs Island, and Portland. And all in 48 hours! Our friends are renting a house up there this summer for a vacation and we wanted to show them around to some of our stops. They'll make their own way when the time comes, but we at least showed them where major things were and what roads to take. We all had an awesome time. This was Clare & I @ Portland Head Light early this afternoon. Oh ya, the seafood was great!! ~Who says there is no place to eat in Sharon? Ambulance Squad for pancake breakfast, Pig's Fly for bar-b-que sandwich for lunch, and the legion has a pork supper. Yumm! I must admit that I had not yet been to "When Pig's Fly" since it had come to Sharon. My wife makes a mean pork bar-b-que sandwich so it wasn't really tempting me to get down there quickly to try it. Well, that all ended last Saturday evening. I got there just by chance at almost 7:20 pm (they close @ 7) as I was not aware of their hours. They were most accommodating to me and got together lickity-split two sandwiches of pulled pork, a side of baked beans and a side of cole slaw. I paid and thanked them a bunch for serving me and promised to be more on-time the next time. I took the food home to my wife, who was totally surprised and extremely pleased. I found some malbec and napkins and we were in business. Your wondering about the food? It was delicious! Plain and simply put...it was delicious. Give them a try, if you haven't. They're located on West Main, directly across from The Sharon Fire Department. More often than not, if you see a unique car in the shopping center, it's a sports car in route to Lime Rock. Today we went to the other spectrum. A '39' Woody came to the center for a short stay, and I had the privilege to take a peak. In one word. WOW! This car is incredible! The steering wheel was the biggest steering wheel I have ever seen! It's owned by a local business person, so perhaps you too might see it out and about. But only on dry, warm days! ~Bright and early on Easter Sunday morning, 2010 in Sharon, Connecticut. Looking south down Main Street to the intersection, The Clock Tower, and South Main all in view. I love this time of day on a holiday......not a soul in sight! ~Did you see tonite's sunset? WOW! I took a series of shots from Syke's Field, but I just can't do it justice, especially color-wise. It was truely one of the most amazing sunsets I have ever seen here in Sharon. Amazing! The Saturday before Easter Sunday at 11:45 a.m. in The Sharon Shopping Center. Not much shopping going on is there? We (I) have plenty to be thankful for in life, and I hope and pray I'm going to get thru this time. But here is a perfect example of how when you have no food store as the draw, what happens to everyone else's business. Yesterday (Friday) I was busier, thankfully, but no where near past years. Seriously I do thank each and every person who has stood by us as best you can thru this time. It had been hard for many of you I am sure too. Back in the 80's the northwest corner came out of the recession after everyone else. I hope that is not true for us this time around. I truely hope this spring brings better times for all of us. Today up on Sharon Mountain we had a different something to look at. Up a tree was a bear and three cubs! Not an everyday occurrence for sure. It brought lots of spectators. I hope the bears handled all the attention o.k. 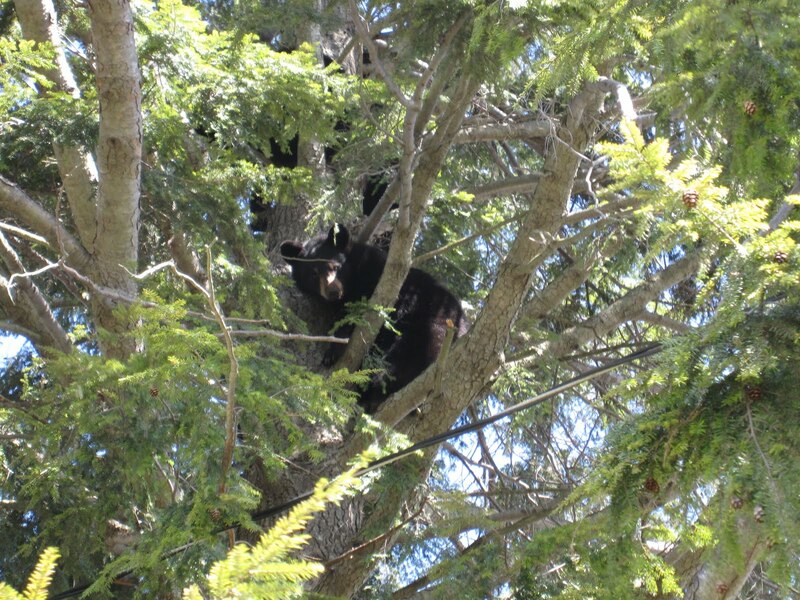 Seeing a bear is becoming, well, somewhat commonplace out on our back roads and in our yards near bird feeders, especially right in this season as the bears have just woken up after a nice sleepy winter and birdseed is a quick, easy meal for them. I hope they climb down tonight and remember to go up a tree not so near the road next time, so they can get some peace and quiet. ~Pass this barn often but with this afternoons sun on it, it just was bursting in bright barn red..the camera probably doesn't do it justice..